Ace of Cups Tarot Card Meaning - All Explained HERE! The Ace of Cups is the first card in the suit of Cups. A largely positive card, you should expect good things to happen when you see it. Cups represent emotions, and so the Ace of Cups can represent a beginning of emotions, think new relationships, friendships and connections. Cups represent our feelings, over our logical thoughts. The Ace of Cups represents abundance, creativity, and strong positive emotions. Past – The Ace of Cups in the Past position can represent a past event where you were passionate and creative. It could have been a time when you experienced a good feeling of ‘flow‘. Do you need something like this now? Think back to that past time and try to remember how you felt to further motivate yourself. Thinking back to past good events can make us feel good now, and remembering the good times in our lives can help us get through the bad times. Life is never an uphill stroll, there are always pitfalls and obstacles, but it is how you deal with it which makes you grow as a person. Present – The Ace of Cups in the present position means life is fine and well. Things are going to go well for the foreseeable near future. Don’t panic or worry if anything bad has just happened, treat it as a learning experience. You’re turning over a new leaf. Expect something new to happen, the Ace symbolises something new, anywhere from meeting a new friend, to starting an entirely new chapter of your life. Look to help others, if you can help by listening to their issues then you will make such a great impact. Future – The Ace of Cups in the future position suggests a future struggle that you will overcome. Imagine yourself climbing a mountain, there is a struggle but so long as you continue upwards you will reach the reward. People often say it as a joke, but you only fail if you give up. Persistence is key. As emotions are tied into this, there is a chance you will have to deal with something which will take a toll on how you feel in day to day life. Good and bad, you will grow and be a better person if you don’t give up. 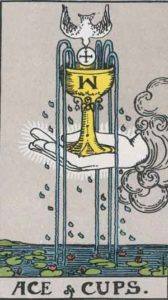 Work / Education – The Ace of Cups in regards to work or education means a new leaf, a new start. You might land that job you always wanted, or possibly move a step towards that path. A very good card to draw when you’re looking for work, or looking to pass that test at school. Try to branch out on your own if you can, if others see how well you can tackle your workload, they’ll become inspired and thank you for it. Romance – The Ace of Cups in romance is a very good sign. Things will feel ‘new’ again. Do you want to be single? Do you want a new level of relationship, or a new relationship altogether? Any choice is possible. Many things that happen in a relationship seem like a big deal at the time, but when you really think over it, it’s nothing. Don’t blow things out of proportion. If you’re in a committed relationship, there may be a change for the better, you might find a new side to your partner, or they might find something out about you. as a couple, this will make you grow stronger together. Don’t be shy, share with those close to you. Friends – The Ace of Cups in regards to friendship means things are going well. Don’t expect any arguments or gossip now or in the near future. It might be a good time to get into some deep conversations with your friends. Expect new friendships to blossom, especially if you have been feeling lonely for some time. Likewise, look for people you know who might need a friend right now, especially those going through tough times. We all walk through life with our minds full of obstacles and problems; you can have a true bond with somebody by helping them through their struggles. Money – The Ace of Cups in regards to finances is another good sign. Are you looking for work or have things taken a bad turn? The Ace of Cups is a good sign, a new leaf that you are meant to turn over. You may need to cultivate a new world view when it comes to money. Do you pay for things you don’t need, or things you could do yourself but are too lazy to do? Look at your finances and look for things you can cut out, or things you can do yourself. Laziness can be a debilitating disease that stops us growing and makes us focus on quick results over good results. Health – The Ace of Cups is good when placed for health. Expect recovery and thought as clear as water, especially if you have been recovering from a physical or mental problem. You should look into how you can help yourself recover. Take care of your body and mind as much as you can. Treat your body well with a good diet, treat your mind well with stimulation. Spirituality and Mentality – The Ace of Cups in spirituality means that now might be a good time to help and inspire others. Do you have any skills you can teach? Why not give it a try? Volunteering is also great for your well-being. You may have some skills that you can use to inspire others, and now is the time, you have the potential to change lives. In reverse, the Ace of cups can signal a block in your life, or an emotional stunting. Look out for things in your life that are holding you back, especially aspects which are blocking your emotions. It can be tough to control how we feel, and sometimes you need to let it all out. Is something building up inside you? Maybe instead of ignoring it, you need to confront it to move on with your life. 1 represents the beginning, creation and initial ideas. All aces symbolise this. The Ace of Cups strongly represents the beginning of an idea; a new project forming in your mind. It can also represent you taking the right path for your life. If you have many Aces in a reading, it is a strong indication that you are at the start of a new part of your life. We’ve selected live tarot readers to give you a FREE 3 Minute interpretation of The Ace of Cups! Scroll through them below and pick your favorite one.